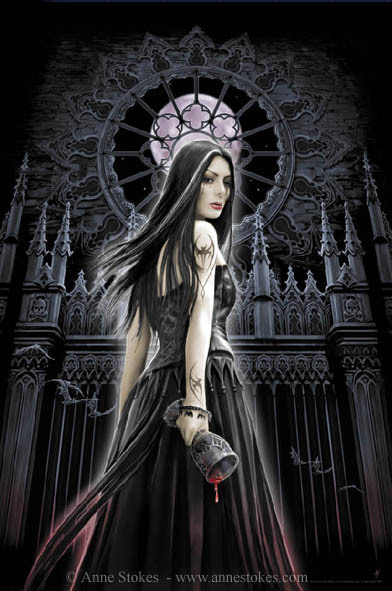 Gothic fantasy artist Anne Stokes is one of the biggest names in this genre, creating amazing artworks that are full of dark visions of danger, lust and gothic horror. She has contributed some fantastic pieces to some of our fantasy art books – in particular our recent publicatons Vampires and Gothic Art – and we can't rave about her enough! The dark gothic imagery Anne favours in her work has led her to create some phenomenal vampire pictures. Of course she isn't drawing lonely counts in crumbling castles or sparkly teenage vampires; her artworks feature raven-haired beauties with the beguiling danger of sirens and blood on their lips. There is something undoubtedly alluring about vampires, who exude both lust and terror all at the same time. Anne's prolific portfolio is not limited to vampire pictures alone. She was first drawn into the world of fantasy when her father read her The Hobbit as a child and has found art as a way to express her love for these fantastic worlds. 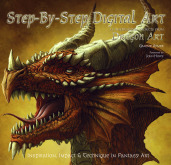 It may be no surprise therefore that dragon art is another recurring theme to Anne's work. If you look closely at her pieces, you'll see the attention to detail that makes her work sensational. The scales she paints on the dragons must be painstaking to do. Anne never launches straight into her work, but she plans out each piece first. Once her head is full of gothic visions, she does preliminary sketches, and then gathers references - this is all before properly starting. Scraps of paper or her camera are never far out of reach, so if something inspires her, wherever she is, she can keep it for reference. Though she doesn't create a whole backstory for her characters, Anne admits that she will have in her head an idea of their personality and envisages the story behind the scene. All of this goes into creating the dark moods and atmosphere vital to her art. What's Anne's advice for creating fantastic artwork? Decide on a strong theme and think how best to convey it before starting. Lighting and especially facial expression (even on dragons) are all important details to creating the right atmosphere. So what do you think of Anne's work? I'm drawn to the darkly gothic atmosphere that emanates from her work, and draws you into each painting. I could look at each one for hours. 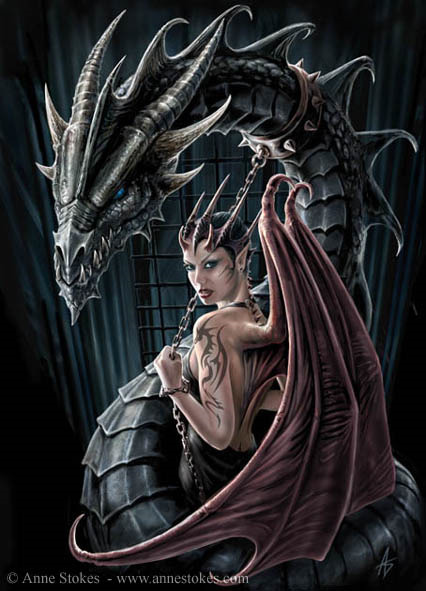 All artworks are © Anne Stokes.